and via the shadow of its window. 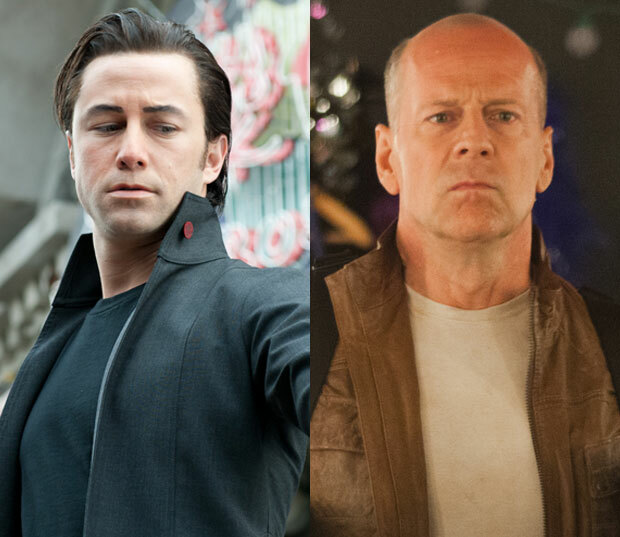 Perhaps it is an inside joke or not, but in the new movie entitled Looper about time travel, (get it, "As Time Goes By"? ), we find a cafe named La Belle Aurore. Also, there are overlapping themes of who is whom, and what is what between Casablanca and Looper. 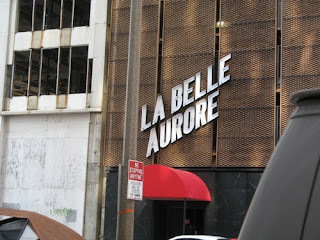 Some folks on the Internet mistranslate La Belle Aurore as "the beautiful sunset." It appears that the more proper translation is "the beautiful dawn." The name Aurora means "dawn." The Roman goddess of the dawn was named Aurora, and her siblings are Sol (Sun) and Luna (Moon). These names in Latin and Greek are Aurora/Eos, Sol/Helios, Luna/Selene. This is a year in which the word Aurora (vis-a-vis The Dark Knight Rises shooting and Aurora copycats) is all too significant. 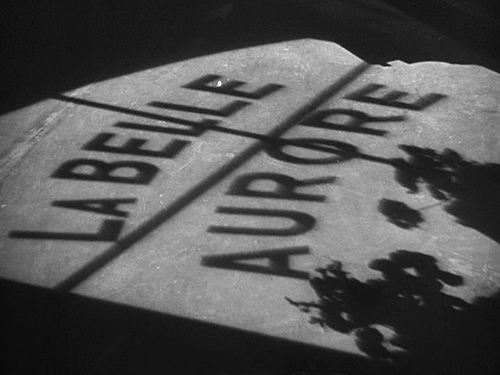 It does appear to be synchrocinematically symbolic for this La Belle Aurore to reveal itself now in a time travel film. Some set photos from Rian Johnson's sci-fi film Looper are presently on the Internet, courtesy of On Location Vacations. 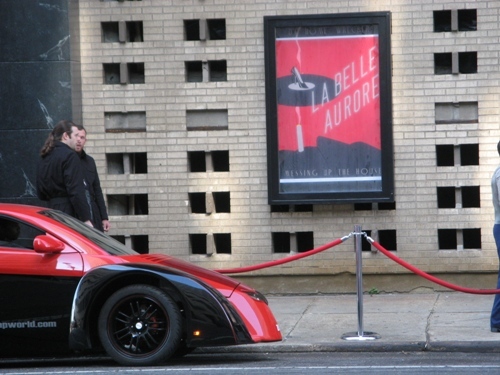 The futurist cars are shown outside La Belle Aurore. Photo of La Belle Aurore as seen in the movie Looper. The fictional film's location for this cafe, in reality, is 219 S Rampart St, off Common Street in New Orleans, Louisiana. Besides time travel, a subtle sub-theme is twins/ids too, for in Looper, actor Joseph Gordon-Levitt is transformed into a younger version of Bruce Willis through the magic of prosthetic makeup. Hat tip to Mark for a hint to a Looper link. "And Joe’s arc in the movie – another film that has nothing to do with sci-fi that I looked really directly to is CASABLANCA, you know Rick’s arc of going from, “I stick my neck for nobody” to the selfless act that he does at the end of it. And CASABLANCA is the same thing, it same thing. It starts with a montage showing the desperateness of all the people that are in this world and why they’re acting that way. Hopefully to give you a cushion to realize he’s not a bad guy he’s just in a situation where this has to happen." While I have not yet seen "Looper," I do love "Casablanca." There are certainly "time elements" to both films. That said, I should note another "time travel" film starring Bruce Willis - "12 Monkeys." The Alfred Hitchcock film "Vertigo" played an important role in "12 Monkeys" as you may recall, with a "flashback" element, just as "Casablanca" does. 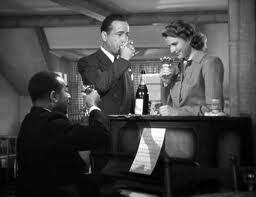 That said, both "Casablanca" and "Vertigo" are timeless, important films. Great post, Mr. Coleman. Joseph Gordon Levitt (who played one of the aliens in '3rd Rock from te Sun', was part of the 'Dark Shadows' series in the early 90's. It was a sort of campy series about vampires, that originally began with Jonathan Frid as the main vampire. Levitt was about 12 or so and played a disturbed child with a governess named Victoria Winters. This series also had to do with time travel. During her stay at Collinswood, Victoria had visions of herself in a past era of who she had been. 1970 Parallel Time, episode 980 to 1060: A room in Collinwood’s east wing enables Barnabas to enter Parallel Time, where familiar people have made different choices and live different lives. 1995, episode 1061 to 1070: Barnabas and Julia are transported to the future, where they find Collinwood in ruins. They question survivors and follow clues, determined to avert the crisis by returning to the present and changing history. Needless to say, Johnny Depp has to get in on it, as usual. Barnabas is played by Johnny Depp in director Tim Burton's 2012 film, Dark Shadows. I haven't seen 'Looper' or heard of it until now, but I see your point about La Belle Aurore having time traveled from 'Casablanca' to 2012. Interesting post and comments. Reminds me of the video of James Holmes speaking about temporal illusion.